Ecological Huairou Text Honolulu (USA), Vladivostok (Russia), and Bali (Indonesia), successively hosted the Asia-Pacific Economic Cooperation (APEC) meetings from 2011 to 2013. Huairou, a suburban district of Beijing became host of the 2014 APEC summit. Compared to the previous famous resort cities, Huairou is not a natural successor. It has endured monumental change: formerly barren land plagued by deforestation is now Beijing's backyard garden after landscape restoration. Nicknamed "the north gate" of Beijing, Huairou has always served as a natural ecological shield for the capital's water conservation. Its area conserves sources of quality drinking water for the capital. Huairou natives have long been able to make livings in the mountains. Born in northernmost Labagoumen Village in Huairou, 46-year-old Peng Xingdong recalls chopping down trees for firewood when he was young. "Looking for the best firewood, we cut down a lot of trees," he remarks. Huairou, a suburban district of Beijing became host of the 2014 APEC summit. "Back then, rural areas lacked resources," notes Peng Tianming, vice president of Huairou Bureau of Landscape and Forestry. He was stunned by the situation in late 1970s. "Even leaves were collected for kindling, leaving bald mountains and naked rocks." After China's reform and opening up, the Chinese government implemented a series of projects including the Three-North Forest Shelterbelt to restore the country's ecological environment. Huairou began to plant trees around hillsides to facilitate afforestation and banned logging, so the forests and vegetation gradually recovered. Peng Tianming and his colleagues have kept busy working in the mountains and fields. "It is said that it takes ten years to grow a tree," remarks Peng. "Our work differs from others. The effects happen slowly. It is like a relay race that needs many generations to be completed." After unremitting efforts over three decades, Huairou residents are finally finding their hometown greener. Especially since 2000, with policy support from both the central government and Beijing local authorities, Huairou has carried out three major projects which drastically improved its environment. The Beijing-Tianjin Sandstorm Source Control Project, for example, invested 407 million yuan to plant tens of thousands of trees and benefit thousands of local farmers, who deemed the project an "ecological bank." By the end of 2013, the greening rate of Huairou District had reached 77.7 percent and forest coverage 54.08 percent, levels topping everywhere else in Beijing municipality. In some areas of the district, forest coverage hits 90 percent, making it a true "backyard garden" of the capital. In the early days, however, locals didn't understand Peng's efforts. "It is understandable," remarks Peng. "These people have lived in, grown up and made a living in the mountains for generations, and then we tell them they are no longer allowed to cut down trees, which only makes their everyday lives more difficult. Certainly they have complaints." But along with environmental improvements, the local people are now benefiting from forest protection and tourism development. Their environmental awareness changed quietly. 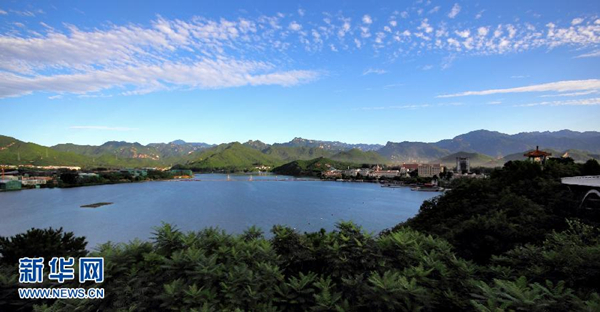 Compared to the previous famous resort cities, Huairou is not a natural successor. It has endured monumental change.